Colleen Adams: Remains of Colleen Adams found after husband arrested. 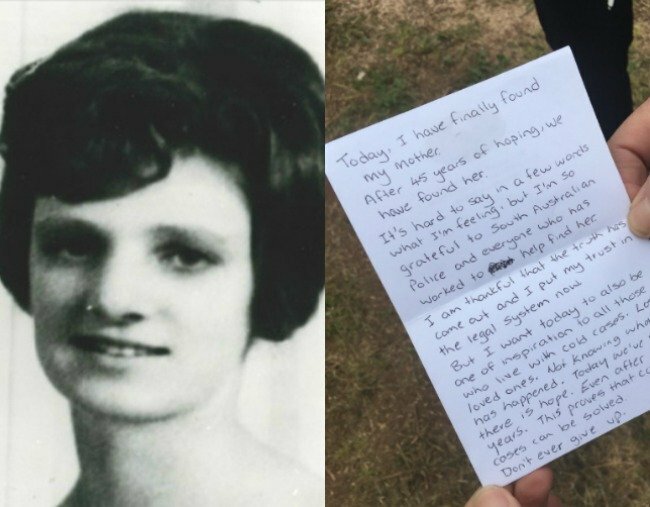 Remains believed to be those of South Australian woman Colleen Adams have been found 45 years after she went missing, as her husband faced court charged with her murder. The body was discovered on the site of the couple’s former home at Maitland, on the Yorke Peninsula, after 70-year-old Geoffrey Adams was arrested and pointed police to the property. SA Police Detective-Superintendent Des Bray said the skeletal remains were found about 1pm on Thursday. “She was in the area indicated to us and discovered about one hour ago, and we’ve made the necessary notifications since then,” Detective Superintendent Bray said. The discovery came a short time before the couple’s youngest daughter, Kaye, visited the site and delivered a statement to the media through victim contact officer Debbie Gibson. “Today I have finally found my mother,” the statement said. “After 45 years of hoping, we have found her. Geoffrey Adams appeared by video-link in the Kadina Magistrates Court on Thursday, after he spent the night in custody at Port Pirie. He did not apply for bail and was remanded in custody to reappear before the court in October. Adams had previously told police he awoke about 7am on Thursday November 22, 1973, to find Mrs Adams fully dressed with two packed suitcases. Claudine Lehner lives across the street from the house and said she was shocked to hear Mr Adams had been charged with his wife’s murder. “I just couldn’t believe it, it was just out of the realm of reality in our little world,” she said.